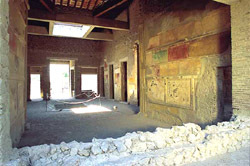 This house, which is situated in the town’s western quarter just before the street forks to the left towards the Porta Ercolano gate, is one of the oldest in Pompeii, dating from the 3rd century B.C.. In addition to the atrium with its surrounding rooms, it has a small covered porch behind the tablinum, a garden and a summer triclinium with stone couches. Towards the rear of the building there is a kitchen, a dining room and several bedrooms. The front of the building houses four shops, a tavern and a bakery with three millstones and an oven with a fireplace alongside. The owner probably took advantage of the house’s proximity to the Porta Ercolano gate and converted it into a boarding house with a number of bedrooms on the first floor and a restaurant next-door.